Decided to see for myself if these dropped in Anguish while waiting for WoS respawn. They don't. Fairly common in Wall of Slaughter. So about 12 hours of playtime between 3 days I finally got the 8 Bloods. Wiped out the western ruins camp in WoS, keeping up with the Dragorn Strategist PH/spawn location as well for s&g's. I've done about 8 epics including 2 epic 1.5's. This might be one of the longer camps, but all in all not to terrible. 81 Bard so collected a tiny bit of AA. Destroyed some random names and kept an optimistic attitude. More importantly you create your sword shortly afterward (if like myself you did the other farming first, Metallic Liquid....ewww). Just a couple simple fights to go. GL. I laid waste to NC and WOS for nearly 2 hrs with a lvl 90 toon and a druid to track mobs....total drops equaled 3, not sure on how many mobs I killed but definitely more than 150. Epic all right, bordering on being a joke and a total waste of time. 1 hour, every mob in most of WOS dead. 1 blood. LOL at rarity of old content epic 1.5 crap. I've done about 8 different epic 1.5's. 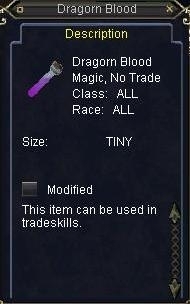 So far, farming this drop is the most annoying part of any of them. I was getting 1 per hour tonight pulling the dragorns from the middle of the wall. It would be nice if the blood were returned on combine instead of being consumed. Winday (Leerah's bard) of Povar. cleared all the dragorns in the zone several times only to get 2 ( in quick succession on the last clear). still killing them. i hate the bard epic. sony should make some of this stuff more common as it becomes more outdated. Does it drop off dragorns in dranik's scar? This dropped off of "a dragorn sentinel" in WoS today. They do drop but are rather rare in my experience. Maybe 1 every 20-30 kills if you're lucky. Dropped from Dragorn Elite Guardsman near WoS zone in Nobles Causeway as well. Dropped off of Ridgerunner Drunt in NC. Drops off verious Dragorn mobs in Walls of Slaughter.